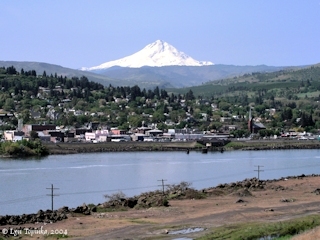 Click image to enlarge The Dalles, Oregon, with Mount Hood. 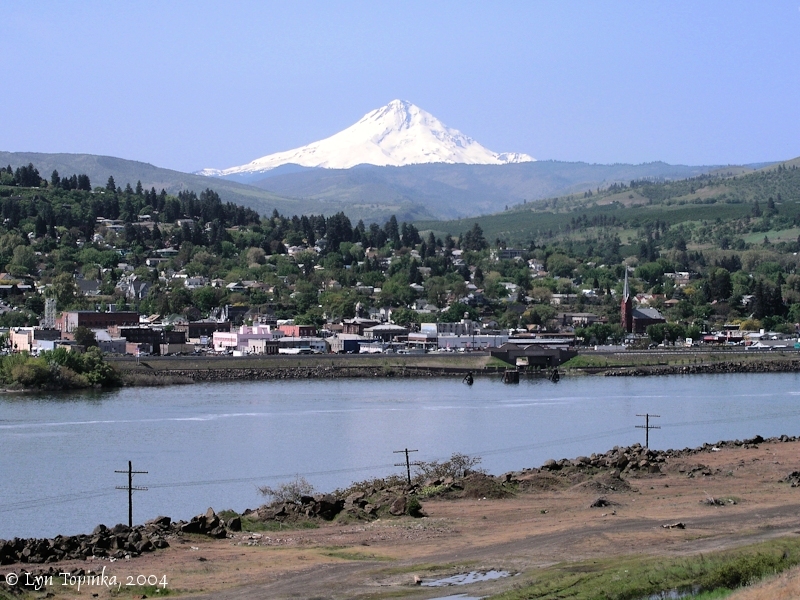 The Dalles and Mount Hood as seen from Dallesport, Washington. Image taken April 24, 2004. 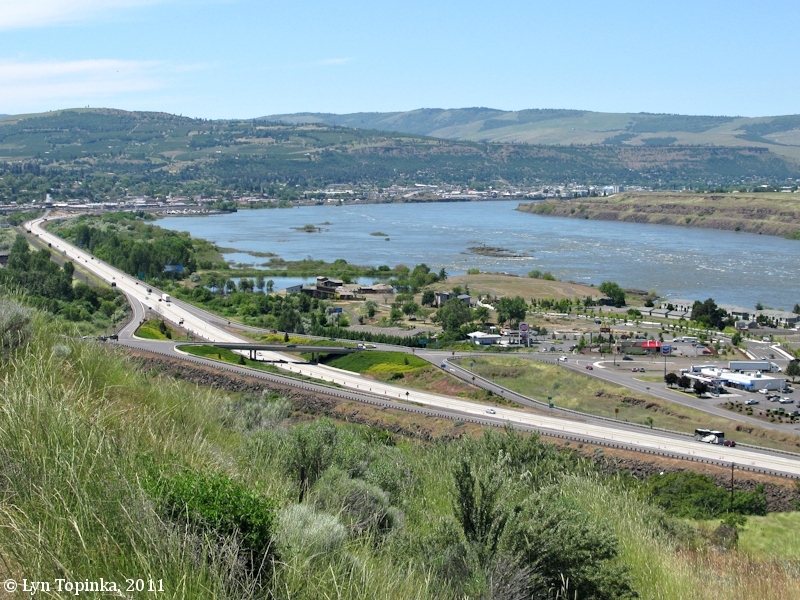 The City of The Dalles, Oregon, is located at Columbia River Mile (RM) 189.5, on the south shore of the Columbia. 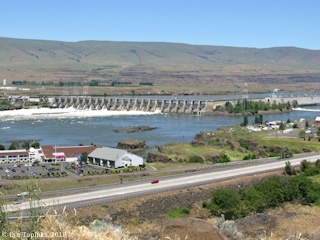 Upstream of The Dalles is The Dalles Bridge and The Dalles Dam. 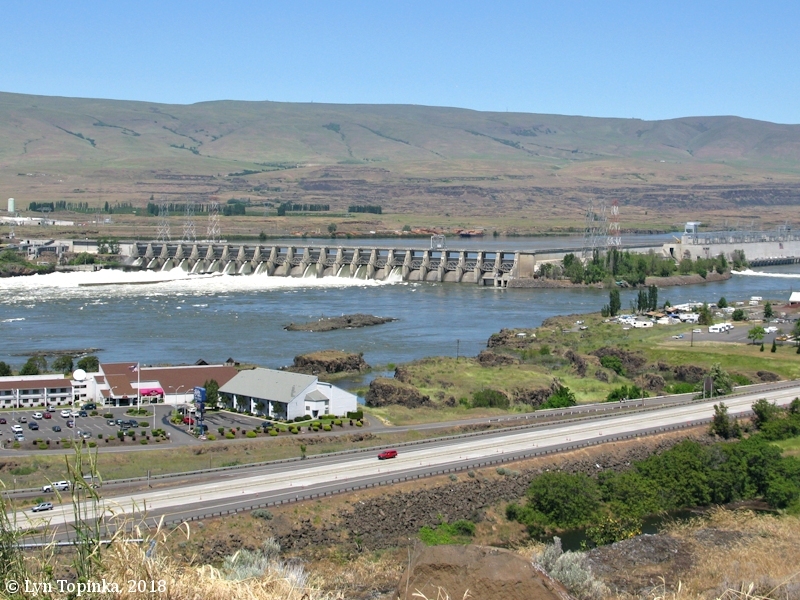 Further upstream is the location of Celilo Falls, now under the waters of Lake Celilo, the reservoir behind The Dalles Dam. Downstream of The Dalles on the Oregon side is Chenoweth Creek, the Columbia Gorge Discovery Center, and Crates Point. On the Washington side of the river lie Murdock, Dallesport, Spearfish Lake, and Columbia Hills State Park. The Dalles takes its name from the trecherous long stretch of rapids upstream, which were refered to as the "Dalles". 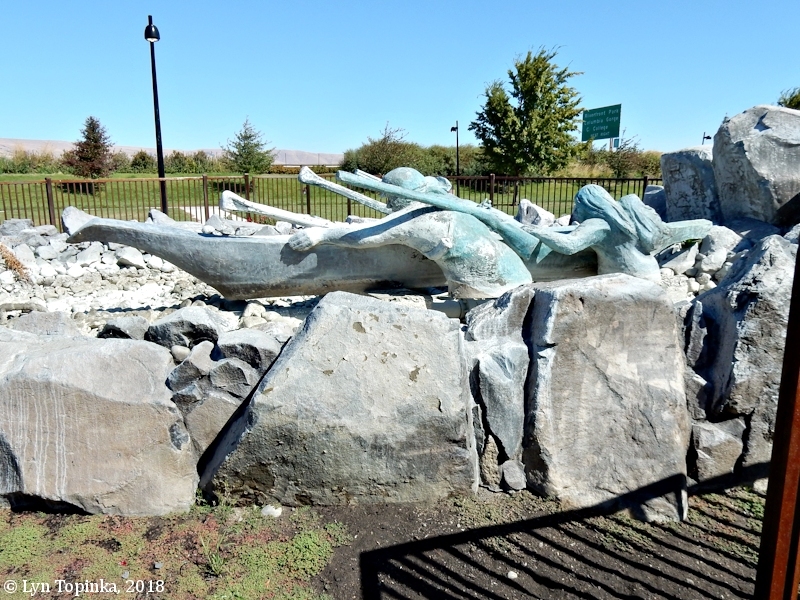 Early trappers were the first to apply the name "The Dalles" to an area of two rapids located at the "Big Eddy", just upstream of today's "City of The Dalles", and continuing to just downstream of the now-under-water Celilo Falls. Gabriel Franchere in 1814 was the first to record the name. Those rapids, also under the waters of Lake Celilo, were later known as "Long Narrows" and "Short Narrows", or "Fivemile Rapids" and "Tenmile Rapids". Lewis and Clark spent 6 nights in the area of today's The Dalles, at a natural rock formation they called Rock Fort. On the upstream side of Rock Fort is Mill Creek which runs through the city. 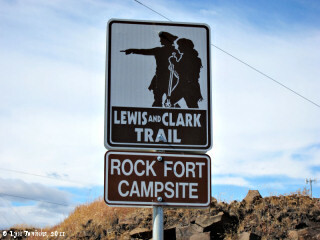 Click image to enlarge Sign, Lewis and Clark campsite, Rock Fort, The Dalles, Oregon. Image taken October 6, 2011. Click image to enlarge The Dalles, Oregon, including The Dalles Bridge and The Dalles Dam (on right), as seen from airliner heading towards PDX. Mid afternoon, clouds, gray, and drizzle. Image taken April 24, 2012. 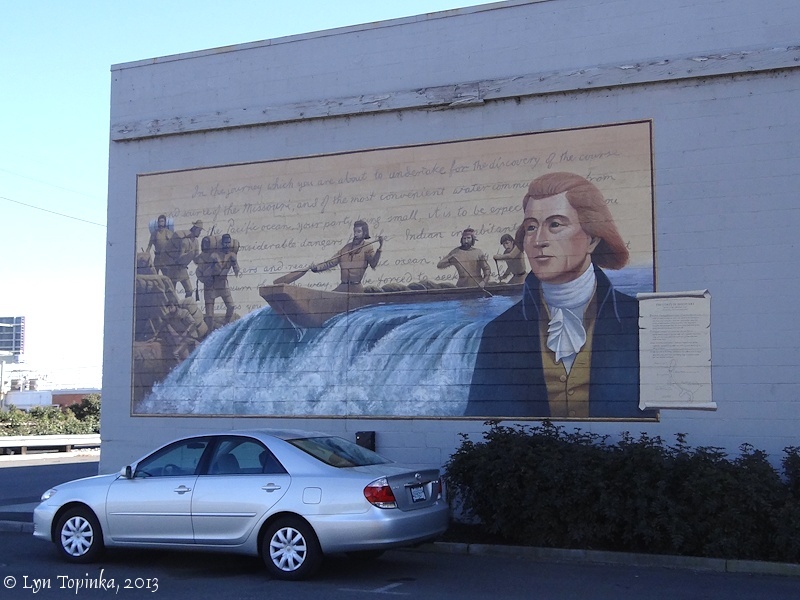 Lewis and Clark stayed twice in the locality of today's The Dalles. 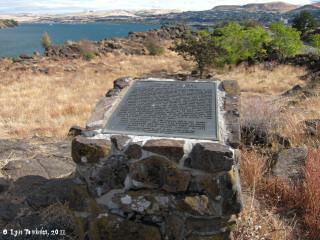 For three nights in October 1805 and for three nights in April 1806 the men camped on a rock formation overlooking the Columbia River which they called "Rock Fort". In 1820 James Birney of the North West Company established a short-lived fur trading fort at The Dalles. In 1838, the Methodists arrived and built a mission named "Wascopam", with Daniel Lee as the leader. The Wascopam Mission was abandoned in 1847 and sold to Dr. Marcus Whitman for $600. The settlement at The Dalles increased in population in the mid 1800s when wagon trains arrive with new settlers on the "Oregon Trail". The Dalles was the end of the land road, with the rest of the journey to the Willamette Valley to be done by boat or raft. A protected harbor at the mouth of Chenowith Creek near Crates Point became the beginning of the water trail for the Oregon Trail travelers. In 1845, Samuel K. Barlow and his family arrived in The Dalles. Barlow was instrumental in building a road around the south side of Mount Hood for Oregon Trail pioneers (see more Barlow Road below). During the Cayuse War of 1847 to 1848, Major H.A.G. Lee, of the Provisional Government's Oregon Rifles, arrived in The Dalles. 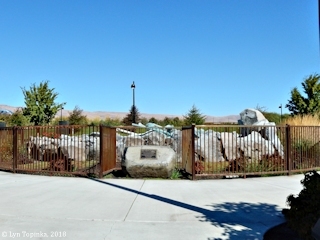 Lee built a stockade around the old mission buildings that became known as "Fort Lee" or "Fort Wascopam" In 1850, two rifle companies came from Fort Vancouver to establish a supply depot at the eastern end of the Barlow Road. Crude log buildings were constructed a short distance west of the old Wascopam mission and was called "Camp Drum". In 1853 the fort was redesignated as "Fort Dalles". In 1861, Fort Dalles was downgraded to a quartermaster's depot before being abandoned in 1867. Only the Surgeon's Quarters remains today, and currently houses the Fort Dalles Museum. The Fort Dalles Museum is the oldest historical museum in Oregon, being established in 1905. (See "The Golden Age of Postcards" below). 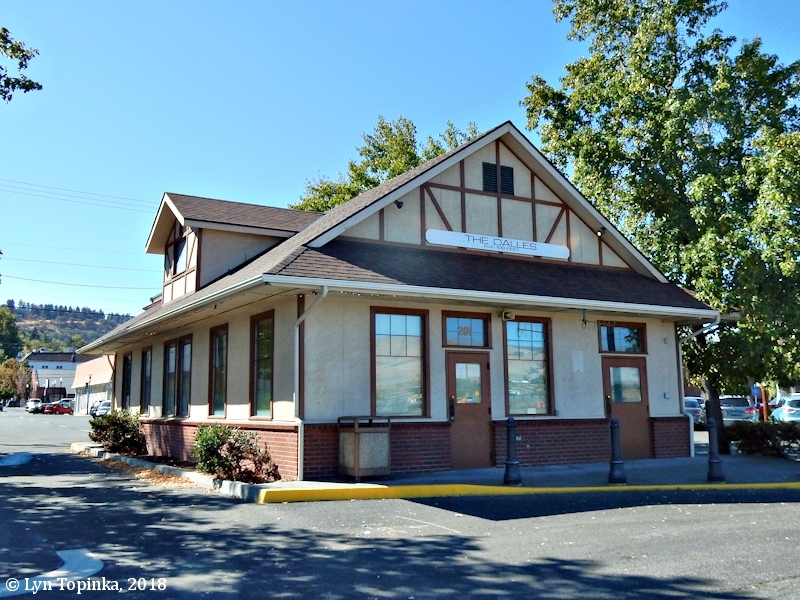 The first post office in The Dalles area was established on November 5, 1851, and called "Dalles". The Post Office's name was changed to "Wascopum" in September 1853. 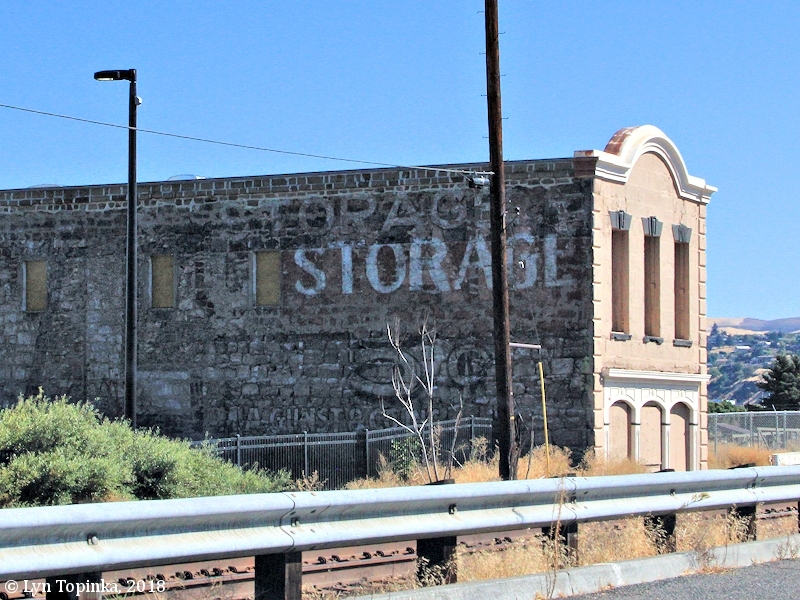 The community of The Dalles was incorporated in 1857 as "Dalles City". (One source, End of the Oregon Trail Website, says it was originally "Fort Dalles" and then changed to "Dalles City".) Common usage however kept the name as "The Dalles", and in March 1860 the Post Office became "The Dalles". On June 7, 1966, the "official name" of the city was changed to "City of The Dalles". 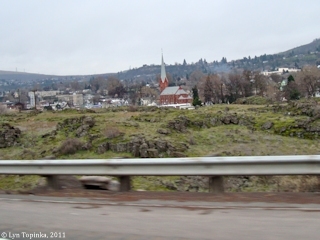 Click image to enlarge The Dalles, Oregon, as seen from the east. View from the Oregon side of the Columbia River, just east of The Dalles. Image taken June 4, 2011. 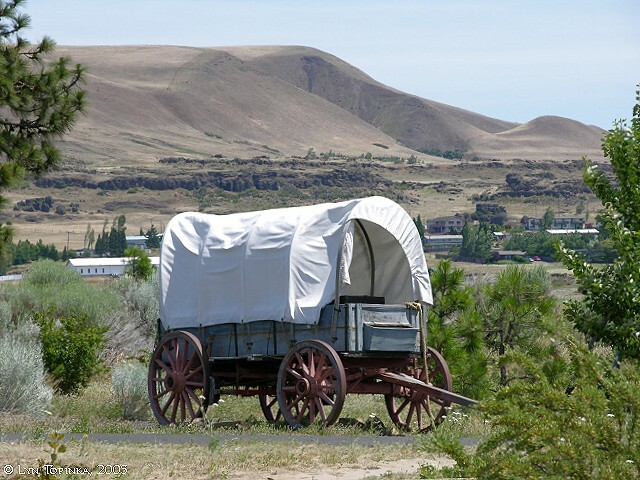 Until 1846, The Dalles marked the end of the overland travel on the Oregon Trail. At the mouth of Chenoweth Creek near Crates Point, emigrants embarked on steamboats, rafts, or canoes for the 83-mile journey down the Columbia River to Fort Vancouver. 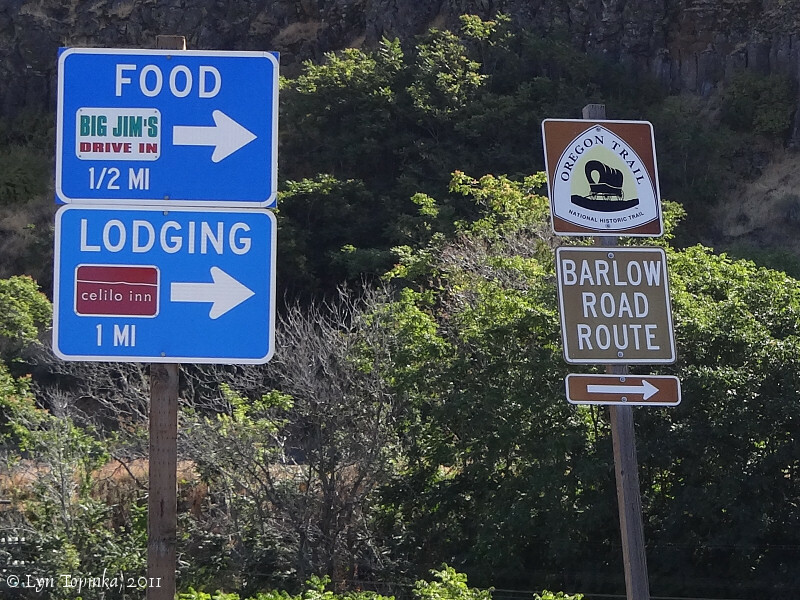 In 1846 the Barlow Road opened, giving Oregon Trail pioneers a decision - to journey down the Columbia River or to cross the mountains by going around the south side of Mount Hood. Neither option was easy. Rafts and livestock were difficult to maneuver along the river's swift currents and the Barlow Road's steep and rocky grades made travel dangerous for exhausted livestock. 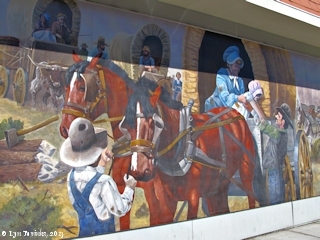 Click image to enlarge Mural, "Decision at The Dalles", The Dalles, Oregon. Mural painted by Don Crook, 1992. Image taken May 8, 2013. Click image to enlarge Mural detail, "Decision at The Dalles", The Dalles, Oregon. Mural painted by Don Crook, 1992. Image taken May 8, 2013. 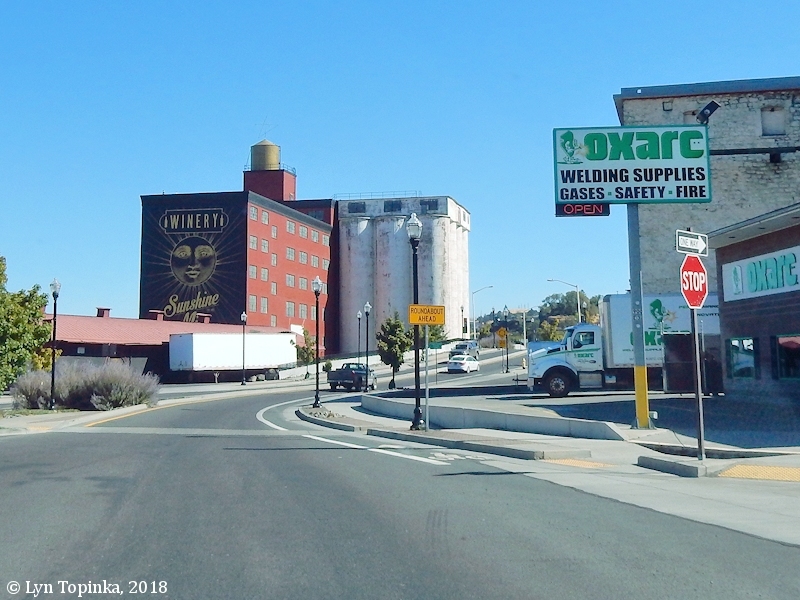 Click image to enlarge Street Scene, The Dalles, Oregon. Image taken September 24, 2018. Brick building on the right is the "I.O.O.F. (Odd Fellows) Hall, built in 1904 and rebuilt in 1915. 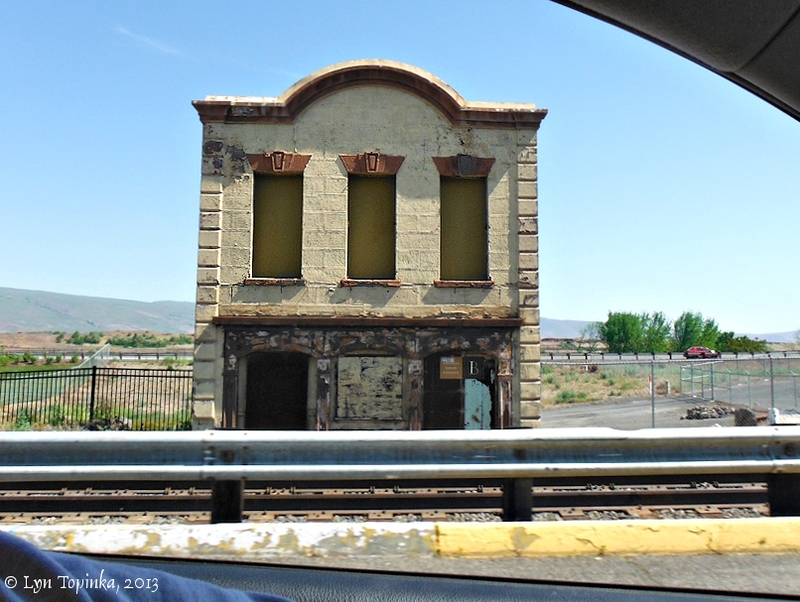 Click image to enlarge Street Scene, The Dalles, Oregon. Image taken May 8, 2013. 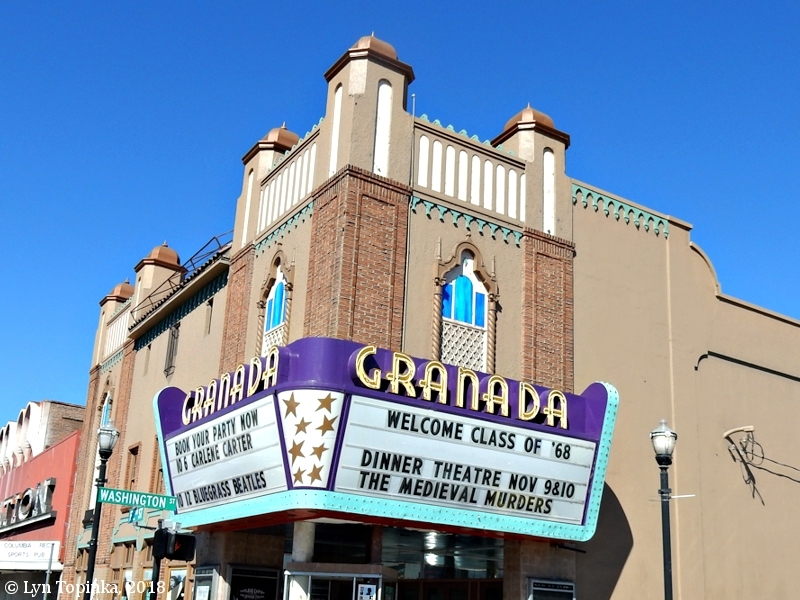 The Granada Theatre was built in 1929 in the Moorish Style. 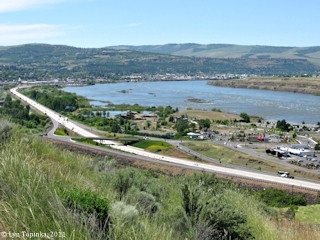 Upstream of The Dalles is located The Dalles Bridge (U.S. 197), connecting Oregon's City of The Dalles with Washington State's Murdock and Dallesport. Between 1854 and 1953 this was the site of a ferry. Since 1953 a 3/4-mile-long bridge crosses the Columbia. Click image to enlarge The Dalles Bridge across the Columbia River. View from the Oregon side of the Columbia River. Image taken June 4, 2011. The The Dalles - Celilo Canal was completed in 1915, creating a steamboat waterway around the Fivemile Rapids ("Long Narrows"), Tenmile Rapids ("Short Narrows"), and Celilo Falls. It provided a clear journey to Lewiston, Idaho. The canal was 8.6 miles long with it's lower end located 3.3 miles above The Dalles. The end of the canal came with construction of The Dalles Dam and Locks. The Dalles Dam is located in the Columbia River at River Mile (RM) 191.5, at the foot of the (now flooded) "Short Narrows" or "Fivemile Rapids". Two miles downstream from the Dam is Rock Fort, Lewis and Clark's campsite of October 25-27, 1805 and again April 15-17, 1806. Also downstream is Oregon's City of The Dalles. One mile upstream is Spearfish Lake, where Lewis and Clark spent the night of April 18, 1806. 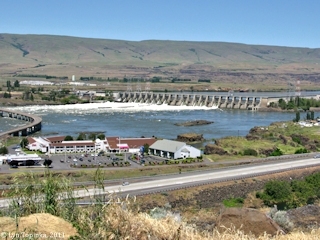 Click image to enlarge The Dalles Dam. View from hills above The Dalles, Oregon. Image taken June 4, 2011. 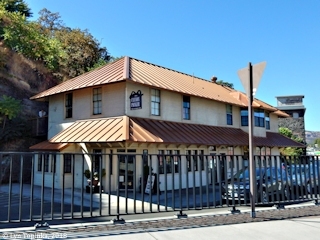 "One of the oldest commercial buildings in the downtown Historic District. 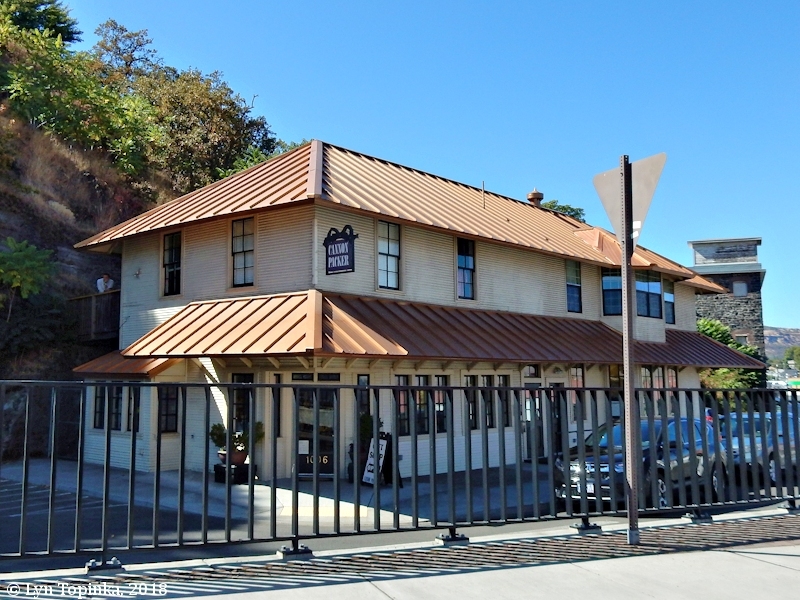 Built as a restaurant, this building became a saloon operated by the Baldwin brothers, James and John about 1877. The Baldwin family owned the building until the early 1940s. In 1962 it was used for a saddle shop known as Bonney Saddle Shop. Once again a restaurant, the Baldwin offers fine dining in an historic setting. Near the backbar is a beautifully painted photograph of a young woman named Carrie Reichwein, done by Wilbur Hayes in 1899. This intriguing piece won first place in the Lewis and Clark Exposition in 1905 and 1906." 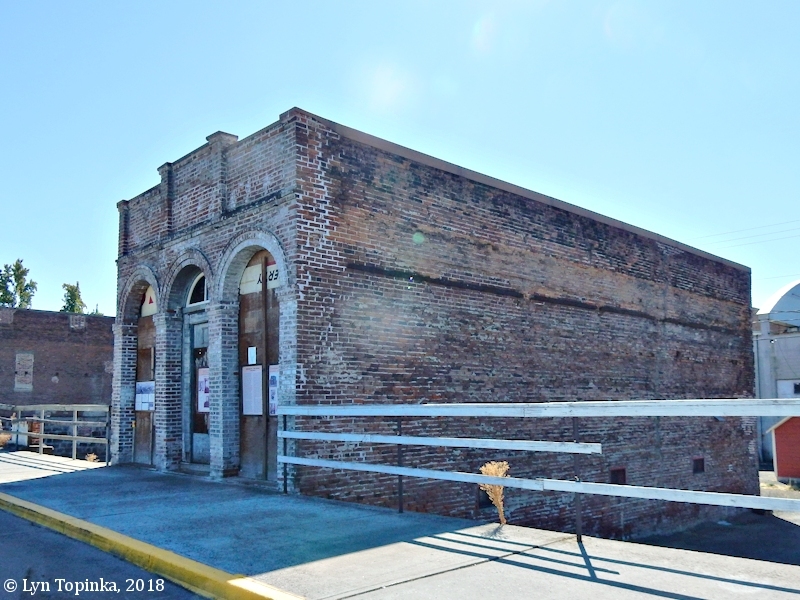 "The Baldwin Saloon ... is a single-story Italianate commercial building now documented to a date of 1877 instead of 1876. Whereas in the documentation of 1985 the building was characterized as having "extensive modifications on all elevations by covering original brick with stucco" and aluminum windows, the primary facade is now restored. In a model rehabilitation project of recent date, stucco was removed from the streetfront and west elevation. The cast-iron facade arcade appropriately frames four bays of double-leaf glazed and paneled doors with arcuated transoms. All the wall openings which were modified with aluminum frames have been restored, and wood frames are reinstated. 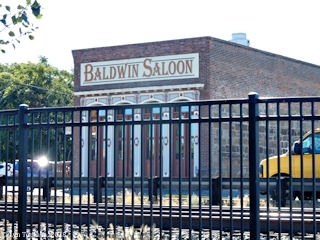 The Baldwin Saloon is one of th oldest commercial buildings in the District and it represents an early method of construction in its use of brick and stone." 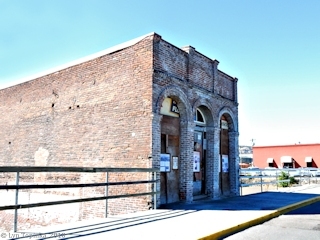 Source: "The Dalles Commercial Historic District", U.S. National Register of Historic Places Nomination Form, #86002953, 1998. Main and Union Streets, Dalles. Source: "The Daily Mountaineer" (Dalles, Oregon), Friday, November 10, 1865, courtesy Historic Oregon Newspapers Archives, University of Oregon Libraries, 2018. 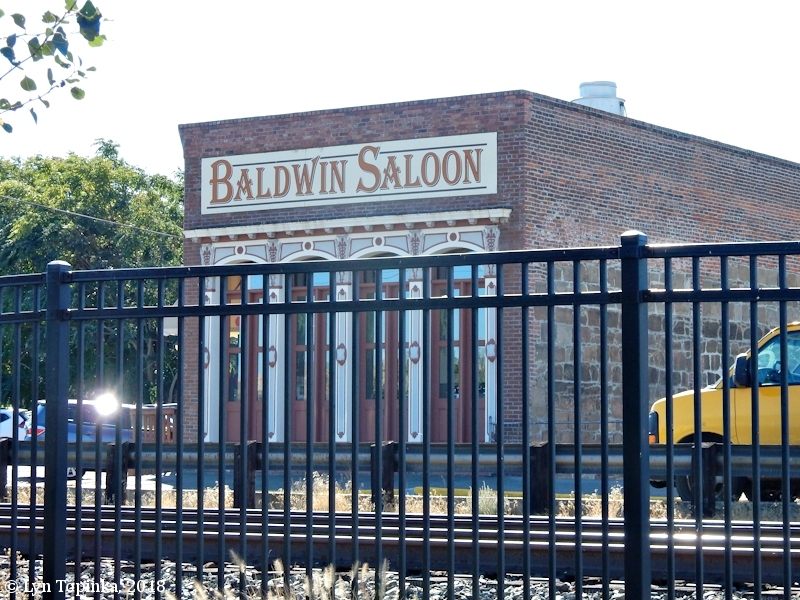 Click image to enlarge Baldwin Saloon, The Dalles, Oregon. View from Lewis & Clark Festival Park. Image taken September 24, 2018. In 1845, Samuel K. Barlow and his family arrived in The Dalles, a stopping place on their journey to the Willamette Valley. 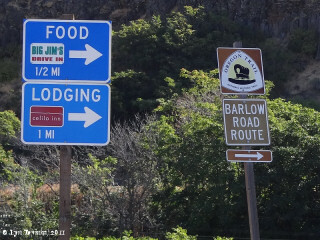 Click image to enlarge Sign, "Barlow Road Route", The Dalles, Oregon. Image taken September 28, 2011. The Black and White Restaurant, located in The Dalles, Oregon, contracted with the Oregon Motor Association to be an "official station" for Columbia River Highway travelers. 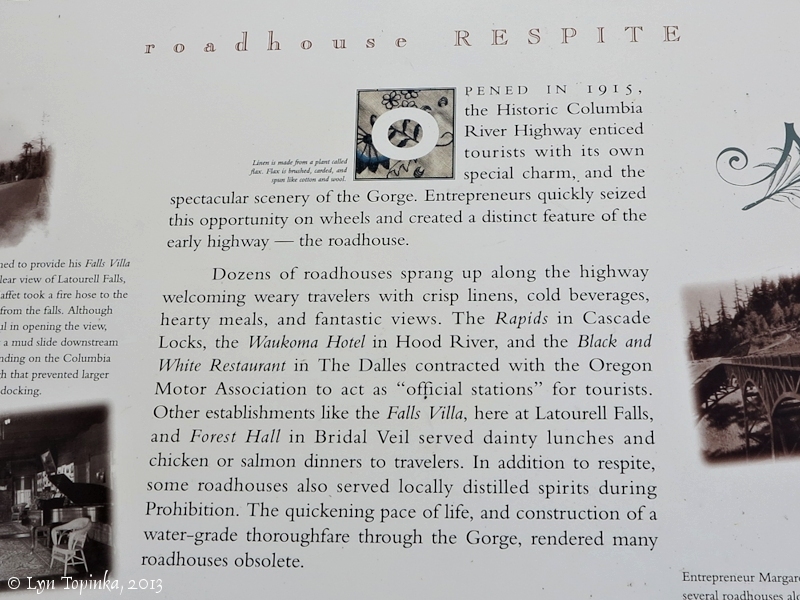 Click image to enlarge "Roadhouse Respite", detail, information sign, Latourell Falls, Historic Columbia River Highway, Oregon. Image taken March 3, 2013. Chenoweth Creek rises in the hills west of The Dalles and merges with the Columbia River at Columbia River Mile (RM) 187, approximately two miles southeast of Crates Point. Upstream of Chenoweth Creek is Rock Fort, Mill Creek, and The Dalles. Downstream is Crates Point and Squally Point. Before the opening of the Barlow Road in 1846, Oregon Trail pioneers launched their rafts at Chenoweth Creek for their final leg of their long journey. 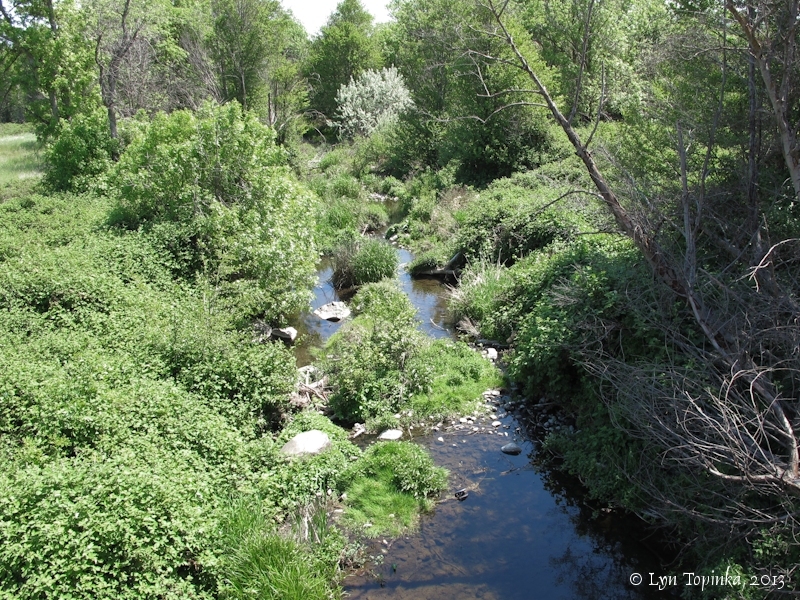 Click image to enlarge Chenoweth Creek looking downstream, The Dalles, Oregon. Image taken May 8, 2013. 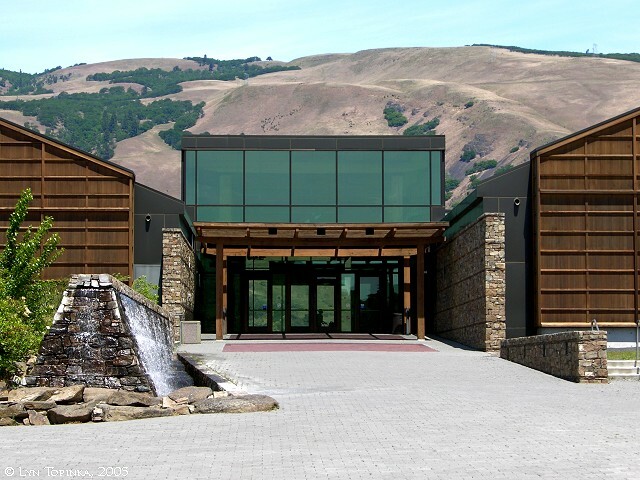 The Columbia Gorge Discovery Center is located in The Dalles, Oregon, just east of Crates Point. 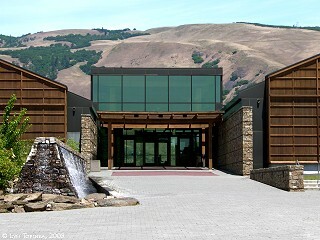 Click image to enlarge Columbia Gorge Discovery Center, The Dalles, Oregon. Image taken June 4, 2005. Click image to enlarge Covered Wagon, Columbia Gorge Discovery Center, The Dalles, Oregon. Image taken June 4, 2005. 201 East Federal Street, The Dalles, Oregon. 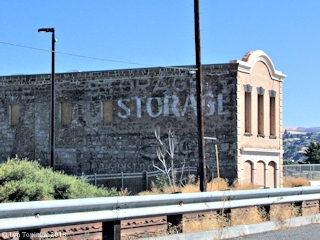 Click image to enlarge "Depot", The Dalles, Oregon. Image taken September 24, 2018. View of the railroad platform side (north side). The Amtrak "Pioneer" discontinued the run to The Dalles in 1997. 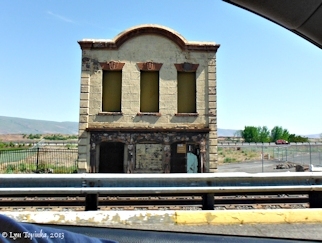 Click image to enlarge "Depot", The Dalles, Oregon. Image taken May 8, 2013. View of the south side. Greyhound made a stop here. 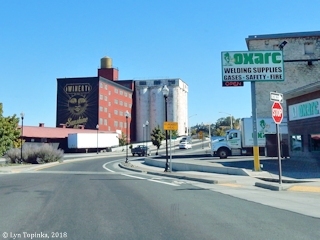 "A drive east on Interstate 84 to The Dalles could provide a bit of inspiration: The east gateway to the city features a roundabout that was decorated with five historic murals painted by a Dalles-area artist. The scenes depicted feature the sternwheeler era, mules helping to harvest wheat, fishing and Celilo Falls, cherry orchards in bloom and pioneers arriving by covered wagon." Source: "democratherald.com" website, 2014, "Editorial: Link new roundabout to city's history: IN: The Albany Democrat-herald, July 15, 2014, retrieved September 2018. 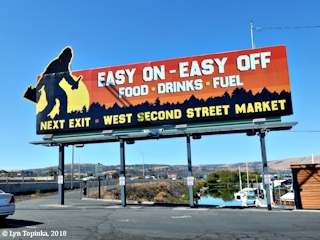 Click image to enlarge East Gateway/Brewery roundabout, The Dalles, Oregon. Image taken September 24, 2018. 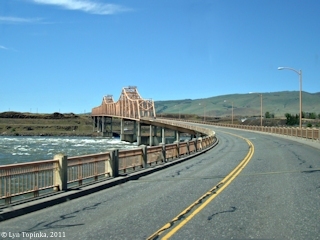 Click image to enlarge The Dalles "Fish Bridge". View looking west. Image taken October 2, 2006. 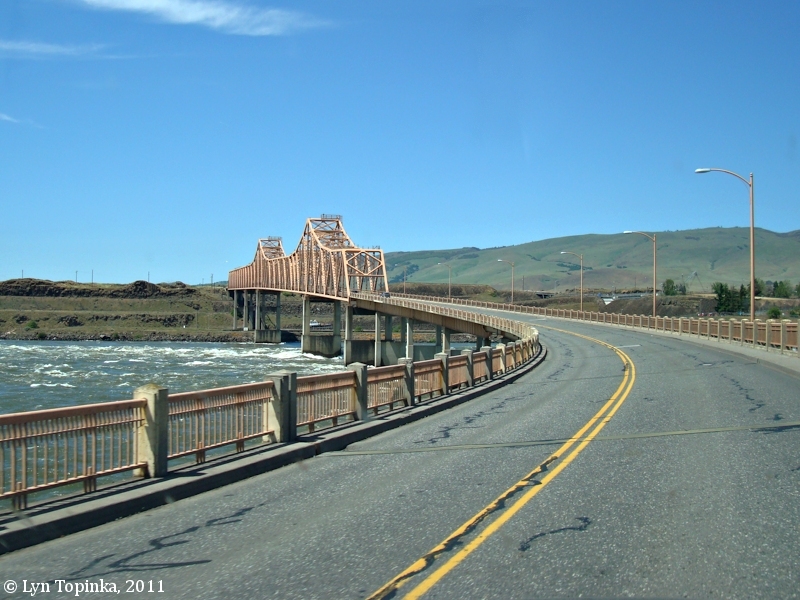 Click image to enlarge The Dalles "Fish Bridge". View looking east while crossing the bridge. Image taken May 8, 2013. During the Cayuse War of 1847 to 1848, Major H.A.G. Lee, of the Provisional Government's Oregon Rifles, arrived in The Dalles. 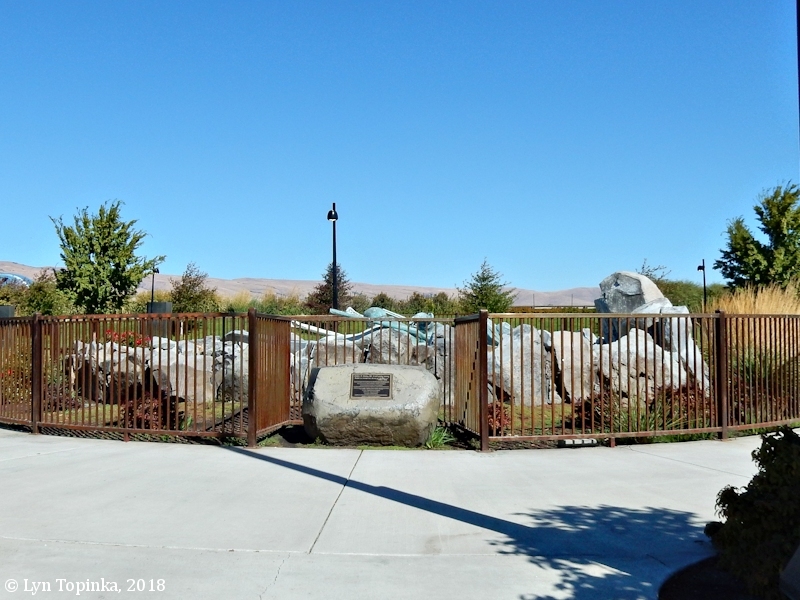 Lee built a stockade around the old mission buildings that became known as "Fort Lee" or "Fort Wascopam" In 1850, two rifle companies came from Fort Vancouver to establish a supply depot at the eastern end of the Barlow Road. Crude log buildings were constructed a short distance west of the old Wascopam mission and was called "Camp Drum". In 1853 the fort was redesignated as "Fort Dalles". In 1861, Fort Dalles was downgraded to a quartermaster's depot before being abandoned in 1867. Only the Surgeon's Quarters remains today, and currently houses the Fort Dalles Museum. The Fort Dalles Museum is the oldest historical museum in Oregon, being established in 1905. In 1971 the Fort Dalles Surgeon's Quarters was added to the National Register of Historic Places. Click image to enlarge Surgeons Quarters, Fort Dalles, The Dalles, Oregon. Image taken May 29, 2012. "When it opened, the Granada was the first theater west of the Mississippi River to feature "Talkies". Closed in the early 1990s, reopened in 1996, and was closed again in 2004, reopened in 2008 as a concert and event venue, closed in 2009. The building is now for sale. [Note: as of 2018 the building was again a concert and event venue.] Visitors are welcome to view the Moorish architectural-style exterior of this historic landmark from the sidewalk." "While built for the prevailing silent film market, the theater anticipated the sound and was "equipped with Vitaphone and Movietone, the only machines for the talkies that can handle all of the big new productions," according to a 1929 The Dalles Chronicle article. Built by M.R. Matthew, the Granada was under a long-term lease for operation to Buy E. Matthew and J.T. Moran. The theater was built according to plans perpared by William Cutts, a Portland architect. 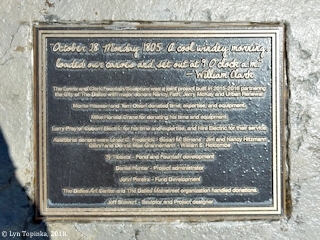 ..."
Click image to enlarge Granada Theatre, The Dalles, Oregon. Image taken September 24, 2018. "The Great Southern Railroad of Wasco County, Oregon, was built in 1905 by John Heimrich and his son J.G. Heimrich. It ran from The Dalles to Dufur, along 15 Mile Creek. In 1913 it was extended to Friend, along Pine Creek. Their original intention was to build a railroad from the Columbia River, through central Oregon, to San Francisco. But in 1909-1911, James Hill and Edward Harriman built competing railroads up the DesChutes River to Bend, and that ended Heimrich’s plan. 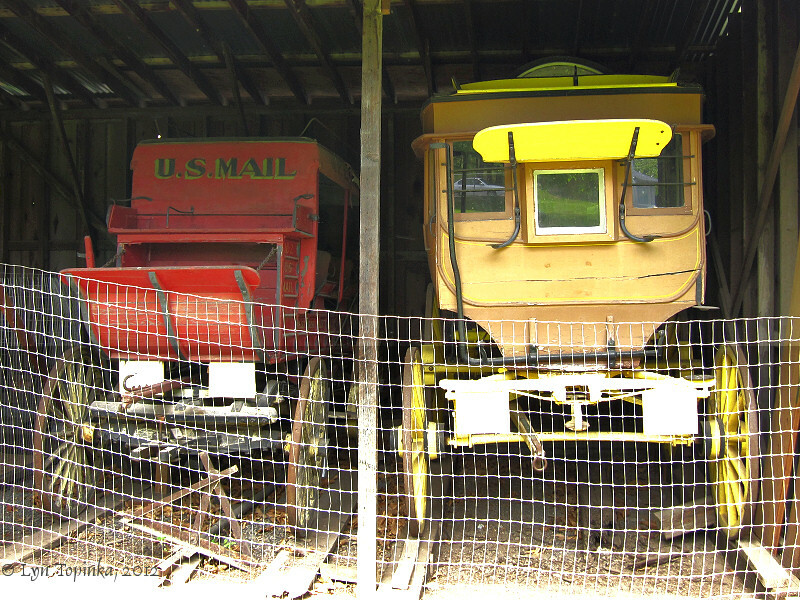 When the railroad arrived in Friend in 1913, that community flourished. It signaled the end of the last stage coach out of Dufur and the demise of a neighboring town of Kingsley. When the railroad was closed down in 1936, it in turn meant the down-sizing of Friend. However the store, school and post office survived in Friend for a number of years after that." 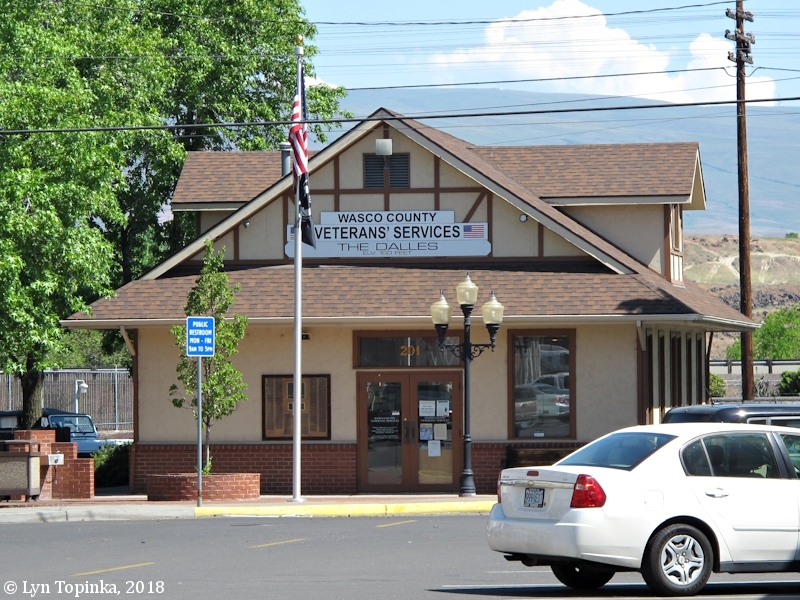 Source: "historicthedalles.org" website, "The Great Southern Railroad of Wasco County, Oregon", narrative by Jerry Tanquist, retrieved September 2018. 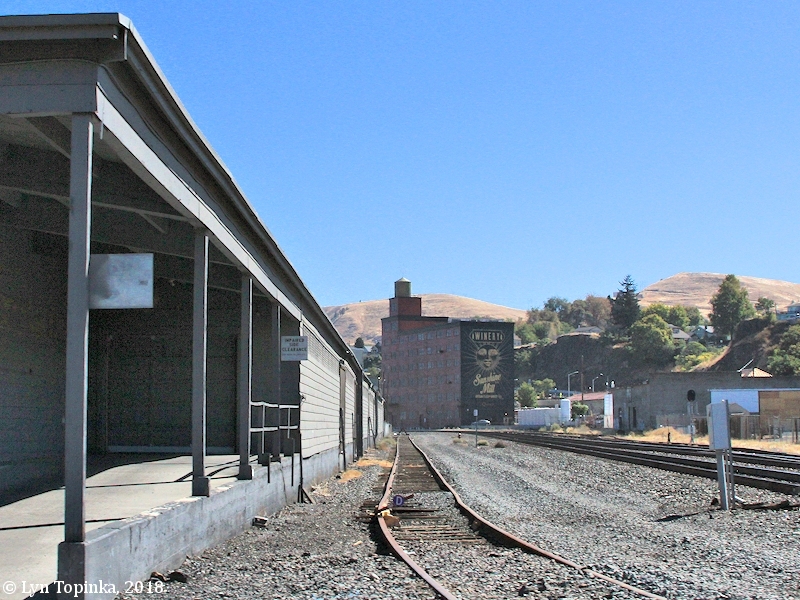 Click image to enlarge Depot, Great Southern Railroad, The Dalles, Oregon. Image taken September 24, 2018. 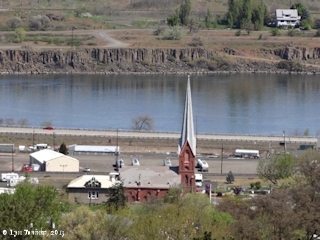 On the upstream side of the The Dalles Bridge lies the Indian Shaker Church and the Gulick Homestead. 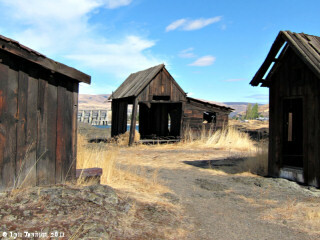 Built in the late 1890s, the historic buildings stand along the Columbia River. In 1978 the Indian Shaker Church and the Gulick Homestead were added to the National Register of Historic Places (Event #78003087). 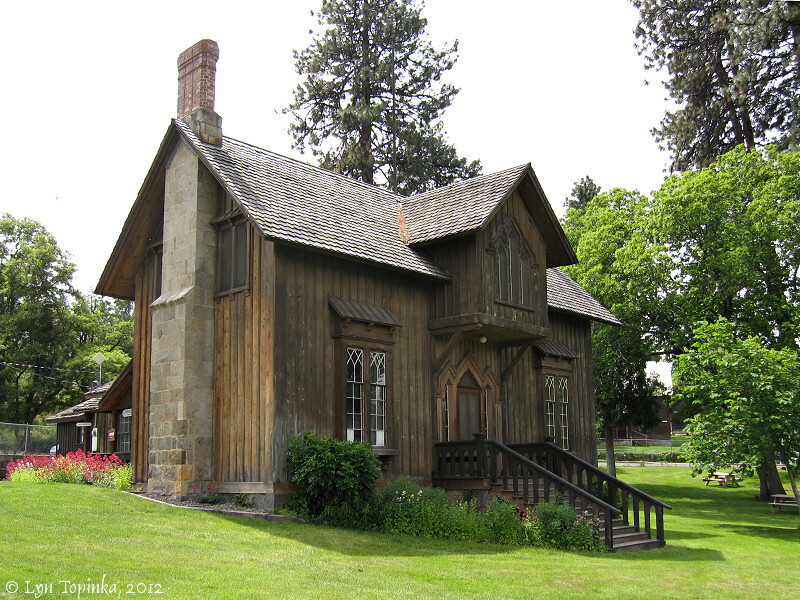 Click image to enlarge Buildings, Gulick Homestead, The Dalles, Oregon. Image taken October 6, 2011. 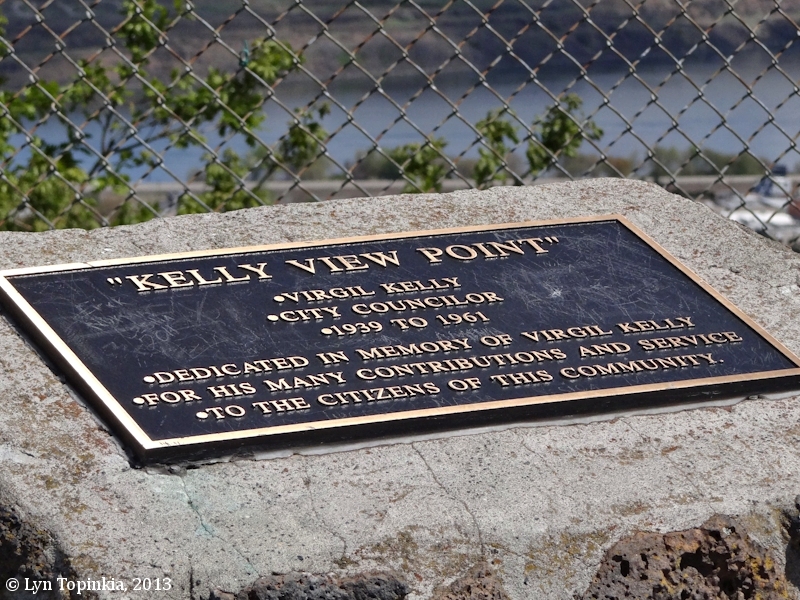 Located on West Scenic Drive, the Kelly View Point offers a fantastic view of The Dalles, The Dalles Bridge and Dam, Mount Adams, and the Columbia River. Immediately south of Kelly View Point is Sorosis Park. Kelly View Point is named after Virgil Kelly, a City Councilor from 1939 to 1961. Click image to enlarge Plaque, Kelly View Point, West Scenic Drive, The Dalles, Oregon. Image taken April 22, 2013. 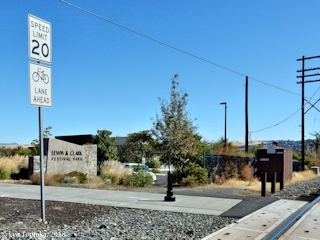 The Dalles' new Lewis & Clark Festival Park was dedicated in 2012. 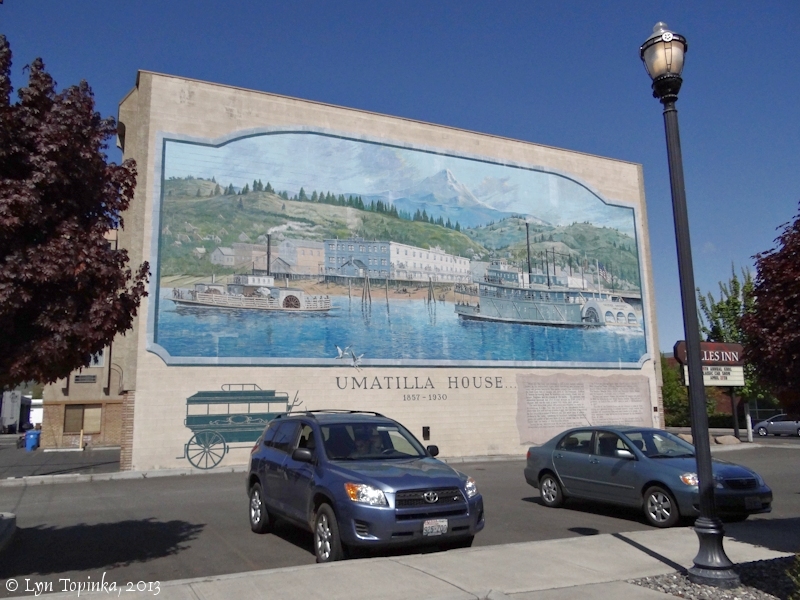 The park is at the location of where once stood the Umatilla House, one of the finest hotels in early The Dalles. The Lewis and Clark Fountain/Sculpture in the middle of the park was built between 2015-2016. Click image to enlarge Lewis & Clark Festival Park, The Dalles, Oregon. Image taken September 24, 2018. 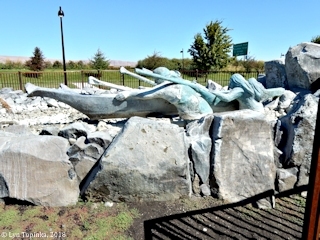 Click image to enlarge Lewis & Clark Fountain/Sculpture, Lewis & Clark Festival Park, The Dalles, Oregon. Image taken September 24, 2018. 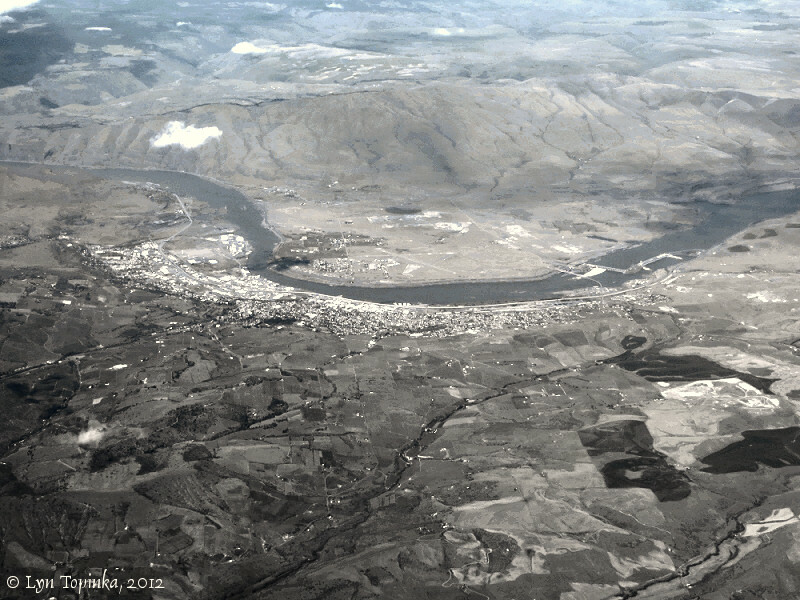 Click image to enlarge The Dalles Dam and the Lone Pine area, The Dalles, Oregon. 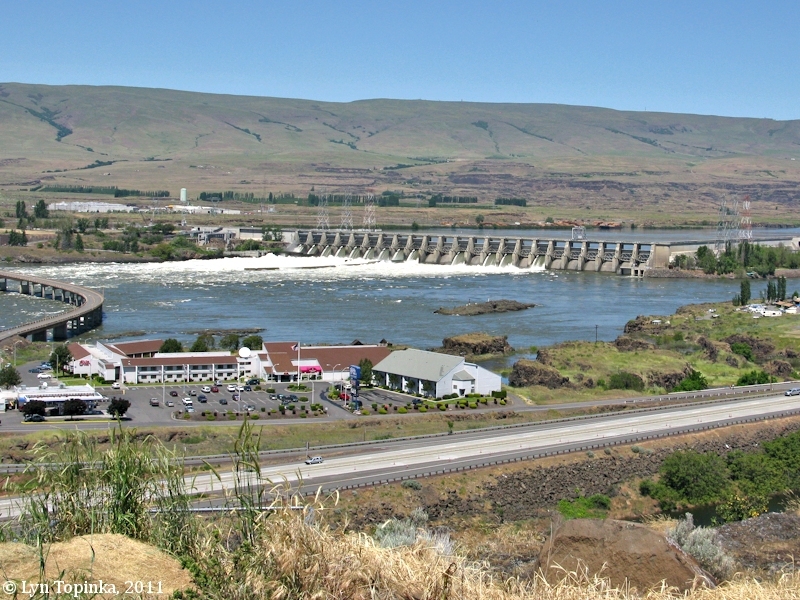 The Dalles Dam (background) with the Shilo Inn (left) and the Lone Pine Tribal "In-lieu" Fishing Access Site (right). Image taken June 4, 2011. 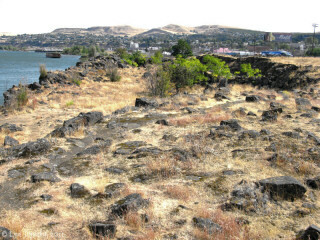 Rock Fort, a Lewis and Clark campsite in both 1805 and 1806, was located just west of Mill Creek at The Dalles, Oregon. Lewis and Clark called the creek "Que-nett Creek". 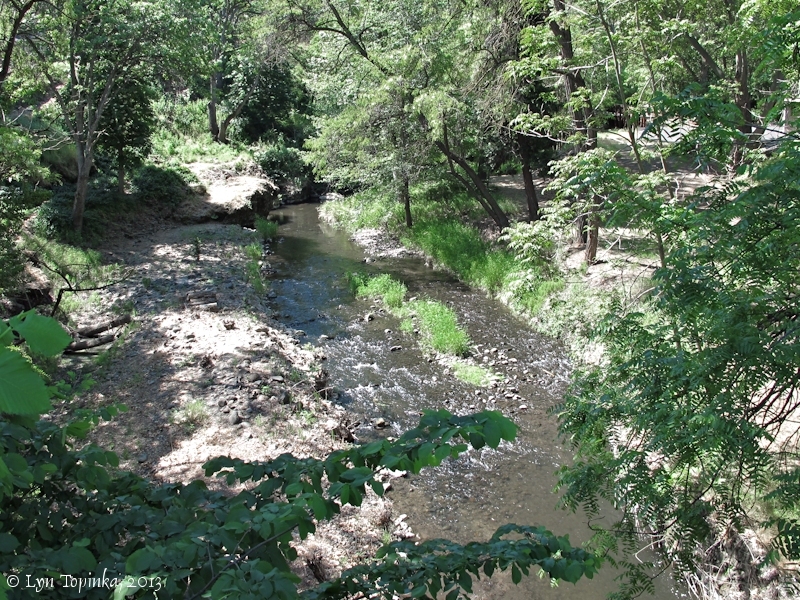 Downstream of Mill Creek is Chenoweth Creek and upstream is Fifteenmile Creek. Chenoweth Creek is where Oregon Trail travelers would group before building rafts and floating down the Columbia River. 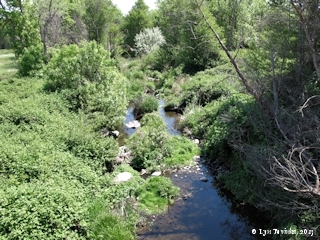 Click image to enlarge Mill Creek, The Dalles, Oregon, looking downstream from the 6th Street bridge. Image taken May 8, 2013. 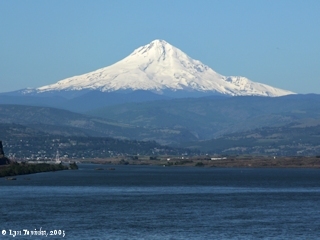 Click image to enlarge Mount Hood, Oregon, with the outskirts of The Dalles in the foreground. View from Washington State Highway 14, upstream of The Dalles. Image taken May 24, 2005. 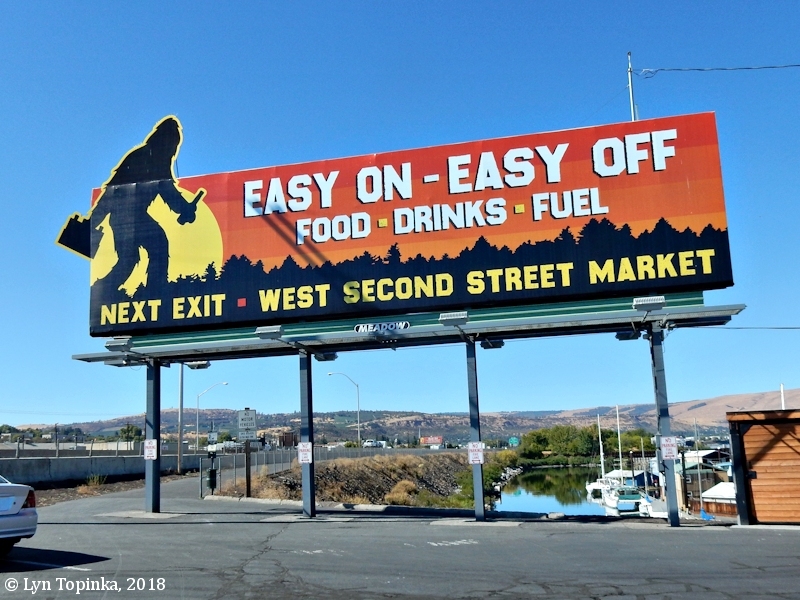 The Dalles, Oregon, is noted for its many murals around town, many of them depicting the history of The Dalles, and some of them just advertising local businesses. 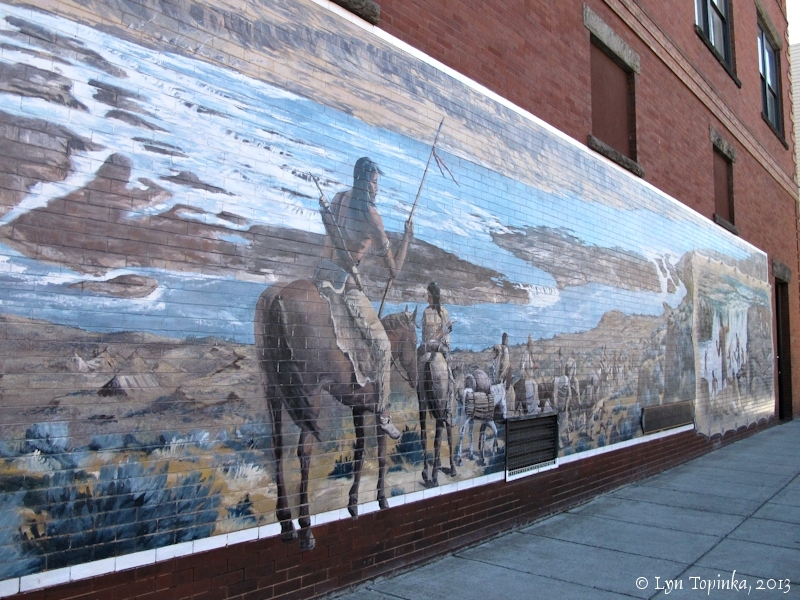 Click image to enlarge Mural, "Corps of Discovery: Into the Narrows", The Dalles, Oregon. Image taken February 8, 2013. Click image to enlarge Mural, "The Dalles, Northwest Trading Center for 10,000 Years", The Dalles, Oregon. Image taken May 8, 2013. Click image to enlarge Mural detail, "Celilo/Wyam - The Great Falls on the Columbia", The Dalles, Oregon. Image taken May 8, 2013. 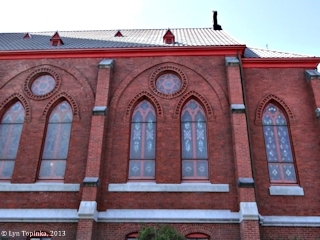 "St. Peter's Landmark, a former Roman Catholic church located at the corner of W. Third and Lincoln Streets, was built in Gothic Revival style and completed in 1898. 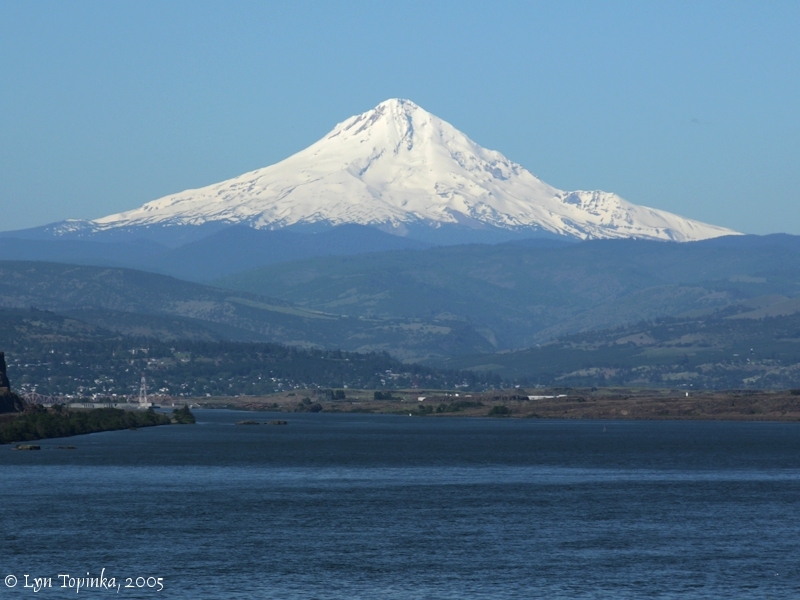 In its early years, steamboat captains on the Columbia River used the 176-foot-tall steeple as a navigational tool. Surveyors still use the steeple, surmounted by a six-foot rooster weathervane, as a benchmark. The belfry contains a 533-pound bell. The interior features a 40-foot ceiling and is illuminated by six rose windows and 34 stained glass windows made by Povey Brothers of Portland, Oregon. The landmark contains three historic organs -- an 1866 pump organ, an 1880 collapsible organ, and a 1907 Kilgen pipe organ which is kept in playing condition. The building was used as a church until 1969. Saved from demolition in 1971, the landmark was listed on the National Register of Historic Places in 1974 now serves as a museum and event venue." Source: Information kiosk, Lewis & Clark Festival Park, visited September 24, 2018. 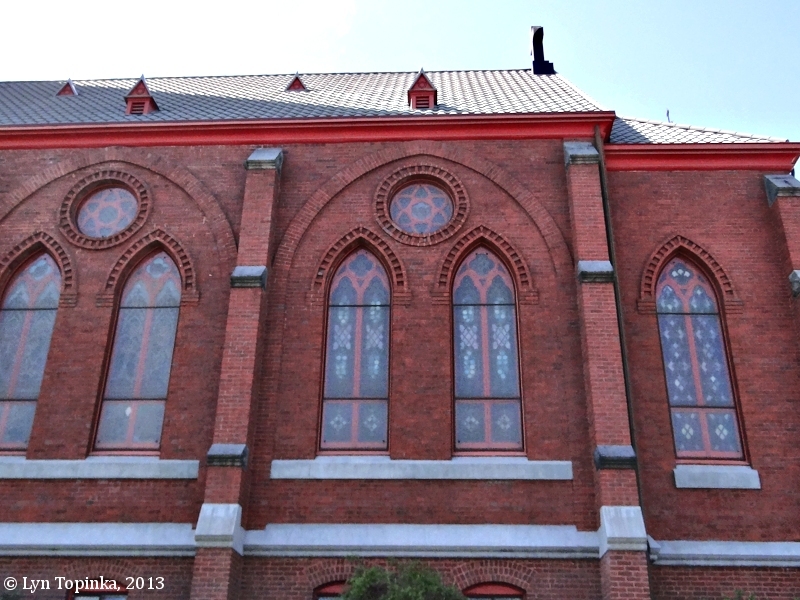 "Gothic Revival style Catholic Church completed in 1898, the building features Carrera Italian marble, Kilgen pipe organ, 40-foot stamped metal ceilings, six foot rooster on a 176-foot steeple, which is the Gorge’s highest spire. Stained glass windows memorialize pioneer families. The wooden Madonna was carved from keel of a sailing ship. The building was used as a church until 1969. Old St. Peter’s has been renovated and is open the to the public as a museum, concert site, and a wedding chapel." Click image to enlarge Old St. Peter's Landmark. Image taken from moving car. Image taken January 30, 2011. Click image to enlarge Old St. Peter's Landmark as seen from above. View from West Scenic Drive. Image taken April 22, 2013. 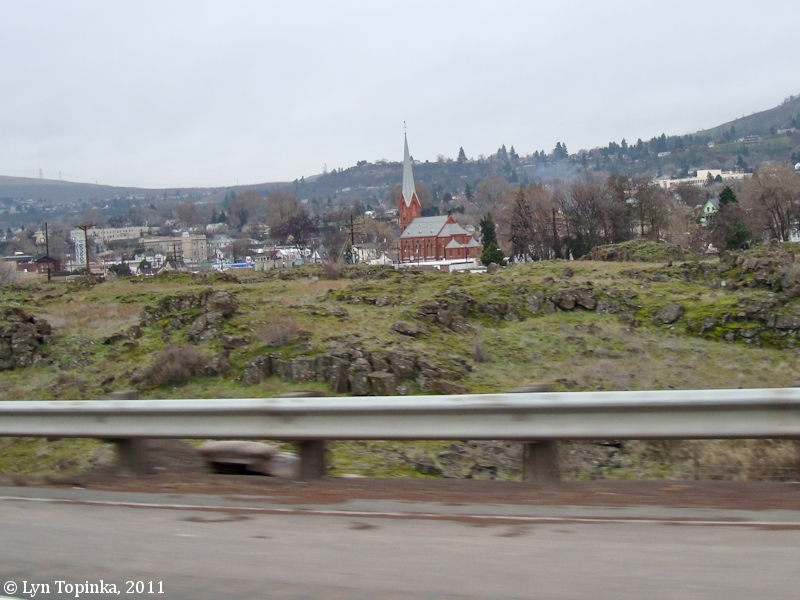 Click image to enlarge Old St. Peter's Church, The Dalles, Oregon. Image taken April 22, 2013. 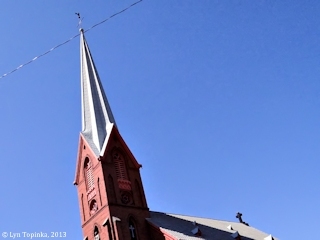 Click image to enlarge Old St. Peter's steeple, The Dalles, Oregon. Image taken April 22, 2013. 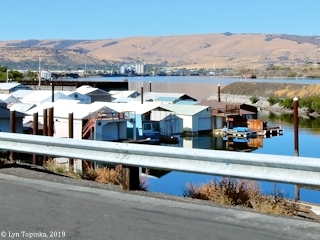 Click image to enlarge Port of The Dalles Marina, The Dalles, Oregon. Image taken September 24, 2018. 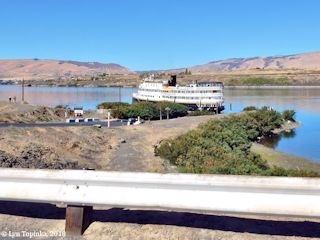 Click image to enlarge "SS Legacy", The Dalles, Oregon. Alaska Cruises. Image taken September 24, 2018. Click image to enlarge Port of The Dalles Marina and Riverfront Park signs, The Dalles, Oregon. Image taken September 24, 2018. 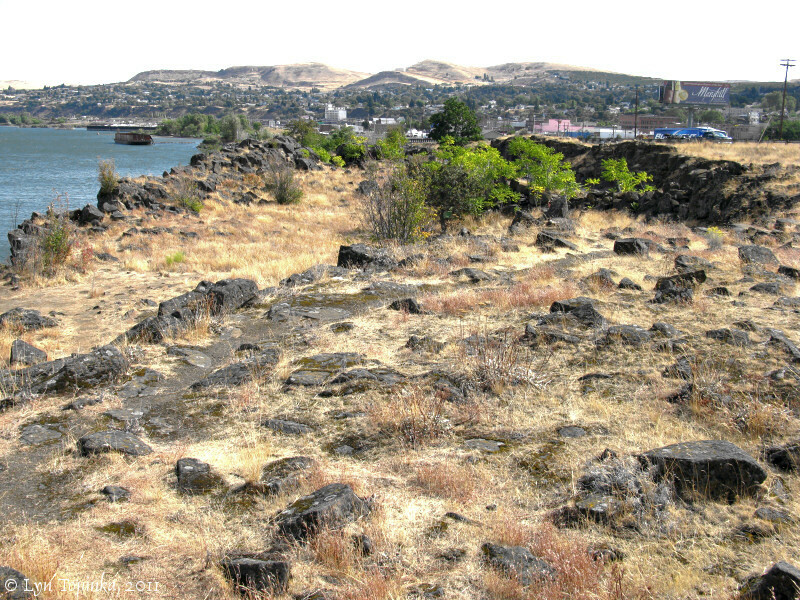 Click image to enlarge Lewis and Clark campsite, Rock Fort, The Dalles, Oregon. Image taken October 6, 2011. 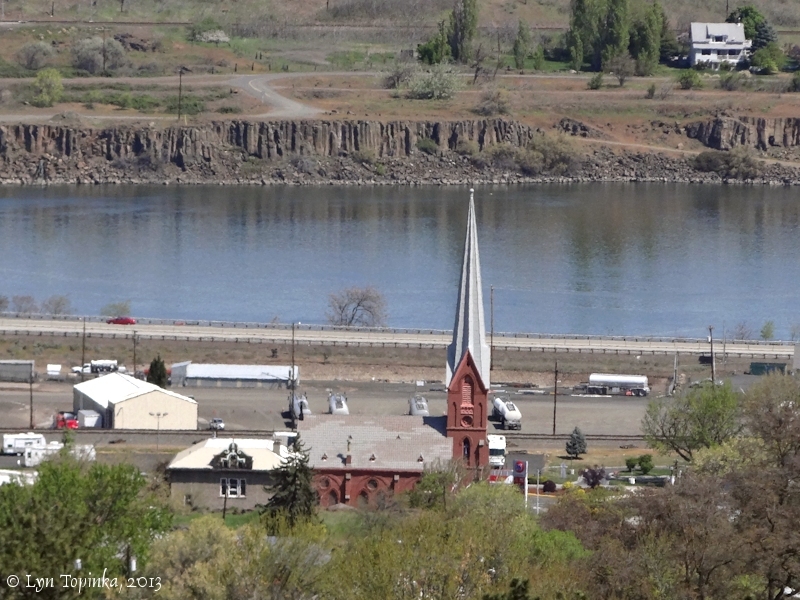 Click image to enlarge The Dalles, Oregon. Image taken September 24, 2018. "The current site for Clock Tower Ales was built as the second Wasco County Courthouse by N.J. Blagen in 1883. The brick two-story structure had county offices on the first floor, a jail in the rear and a large court room on the second floor. 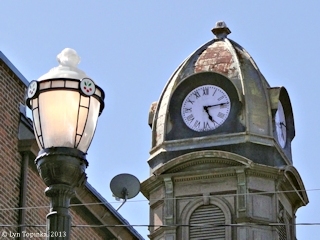 The belfry held the “town clock.” Second Courthouse was the scene of the last public execution in Oregon, outside the state penitentiary, in 1905, a hanging. Norman Daniel Williams met his demise from the hanging platform still visible off the west side of the second story. His case was one of the first to convict based entirely on forensic evidence. The building was the home for the Masonic Wasco Lodge No. 15 ... [and] ... later used as a funeral home ... in February 2010 opened as the Clock Tower Ales restaurant. The owner has vowed to always sell “Dead Guy Ale” in honor of the building’s history." 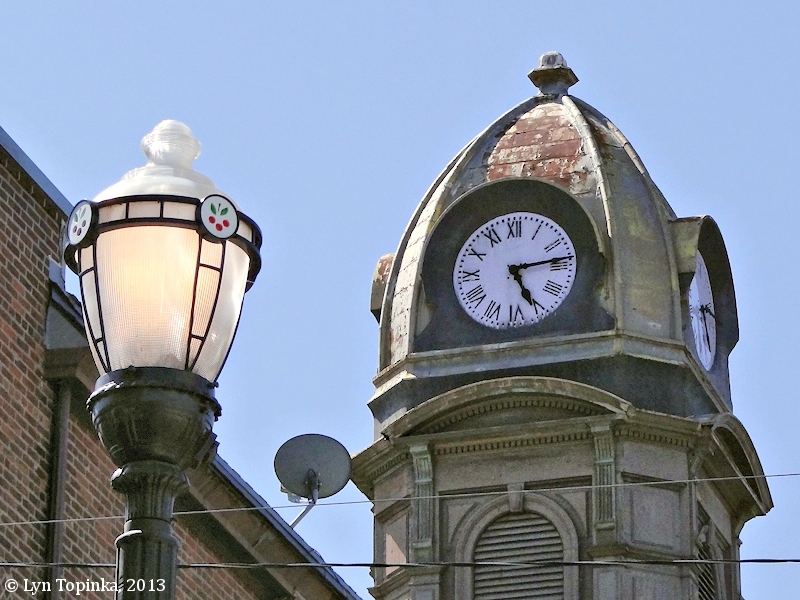 Click image to enlarge Clock Tower, Second Wasco County Courthouse, The Dalles, Oregon. Image taken April 22, 2013. The "Seufert Bros. Co." was established in The Dalles in 1881 by brothers Francis Anthony and Theordore Seufert. This enterprise became one of the largest salmon fishing and processing establishments on the Columbia River. 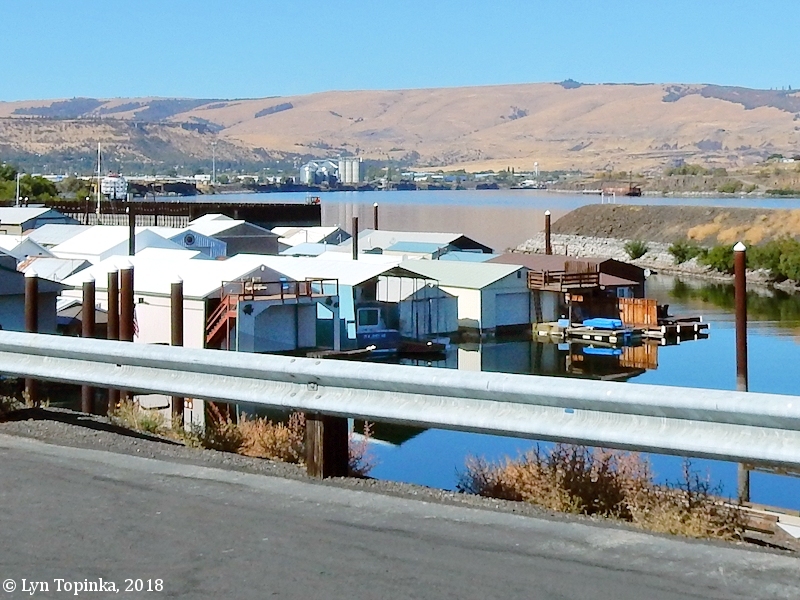 The brothers owned the majority of of the fish wheels surrounding The Dalles, and their cannery was located at Columbia River Mile (RM) 192, just upstream of today's The Dalles Dam. The Cannery building burned in 1973. 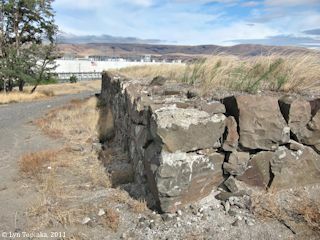 Today all that remains of the Cannery is a remnant stone wall near The Dalles Dam's visitor center, and a fish wheel foundation near the river. Click image to enlarge Seufert Brothers Cannery remains, The Dalles, Oregon. Image taken October 6, 2011. 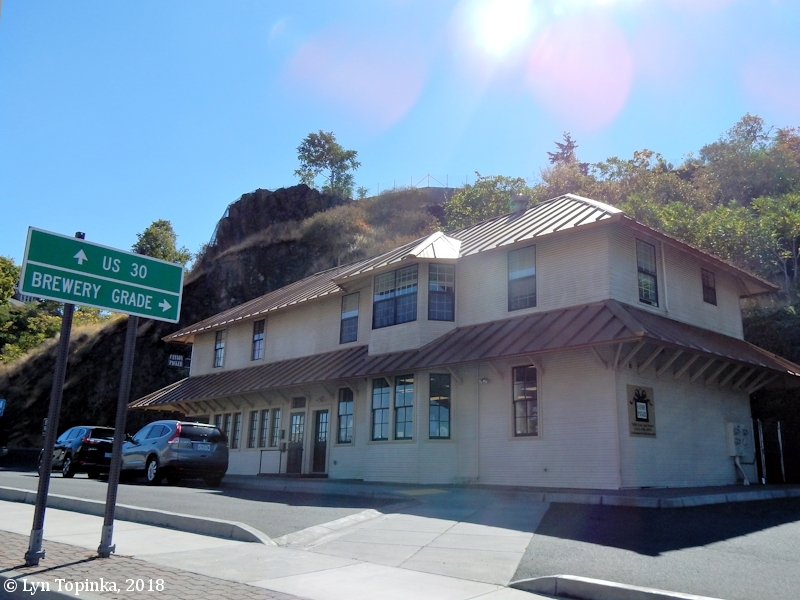 According to the "SunshineMill.com" website, the Sunshine Mill has milled wheat on the property for more than 130 years, was the first building in The Dalles to have electricity, and is the only designated skyscraper in the Columbia River Gorge. The property, which today houses the Quenett and Copa Di Vino wineries, was once owned by the Sunshine Biscuit Company and the wheat milled there was used to make Cheez-It crackers. 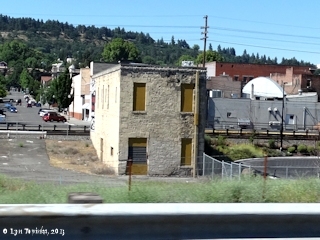 Click image to enlarge "Sunshine Mill", The Dalles, Oregon. Image taken September 24, 2018. Built in 1857 and demolished in 1929, the Umatilla House was known as the "best hotel west of Minneapolis and north of San Francisco". It was located in The Dalles, Oregon, on the northeast corner of First ("Main") and Union streets, right across from the steamboat landing. Today this is the location for The Dalles' "Lewis & Clark Festival Park". Click image to enlarge Mural, "Umatilla House", The Dalles, Oregon. Image taken April 22, 2013. 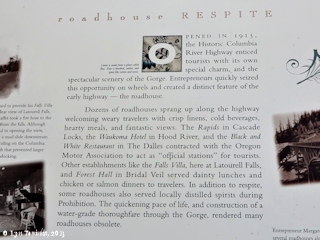 Click image to enlarge The Dalles to Prineville "N.P. 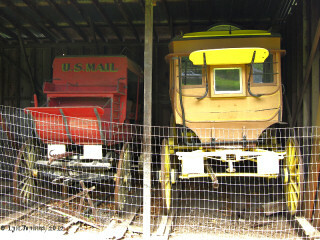 Express" stage coach/mail wagon, and the 1870s Umatilla House omnibus, Fort Dalles Historic Vehicle Collection, The Dalles, Oregon. Image taken May 29, 2012. 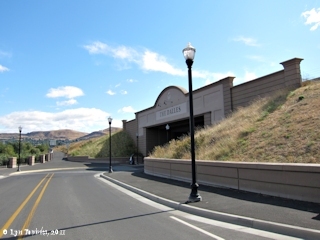 The Union Street Underpass connects downtown The Dalles to the Columbia River, allowing town access to the Riverfront Trail. 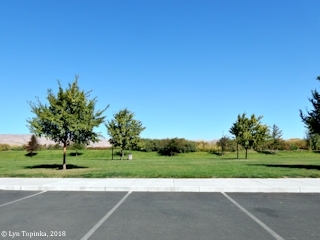 The Riverfront Trail is a scenic 7.4 mile long asphalt trail bordering the Columbia River, extending from the Columbia Gorge Discovery Center parking lot (west) to the Riverfront Park (east). Click image to enlarge Union Street Underpass, The Dalles, Oregon. Image taken September 24, 2018. Click image to enlarge Union Street Underpass and the Riverfront Trail, The Dalles, Oregon. Image taken October 6, 2011. The Waldron Bros. Drug Store (also known as the Gitchell Building) was built around 1867 by pharmacists Henry J. and George W. Waldron. Stone mason Henry Clint is reported to have constructed the building. The Waldron brothers used it as a drug store with offices above, and when Henry Waldon served as Postmaster, the Post Office was also located here. Throughout its many years the building has also served as home to other businesses, including the Wasco Lodge, the "The Weekly Mountaineer" newspaper, and the law office of Judge Joseph Wilson. 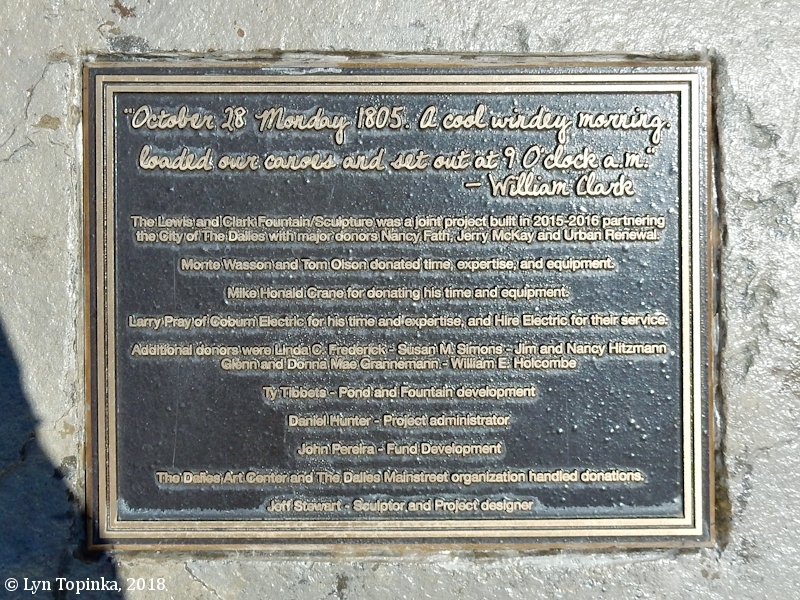 The building survived the fire of 1891 and the "Great Flood of 1894". Between 1923 to about 1938 the Gitchell family owned the building and renovated it as apartments. It is currently owned by the City of The Dalles. 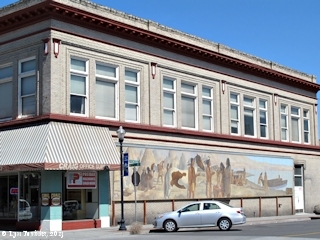 The building is part of the "The Dalles Commerical Historic District", listed in 1986 on the National Register of Historic Places (District #86002953). The building was erected c.1867 by pharmacists Henry J. and George W. Waldron and was called the Waldron Bros. Drug Store. Henry Clint, a stone mason, was reportedly the mason responsible for the construction. The building was originally used as a drug store with ofices above. Henry Waldron was also a postmaster at one time so the post office was located here (he was also Wasco County treasurer in 1864). Henry died of overexertion in the 1878 city fire. ... By the turn of the century, the building stood vacant. The 1926, Sanborn Fire Insuurance Maps indicate that a stage transfer station was located in the building. Later owners of the building include the Gitchell family who owened it from 1923 to c.1938 and had the Gitchell APartments in the structure. The Hyde family who owned the building from 1946-1978. 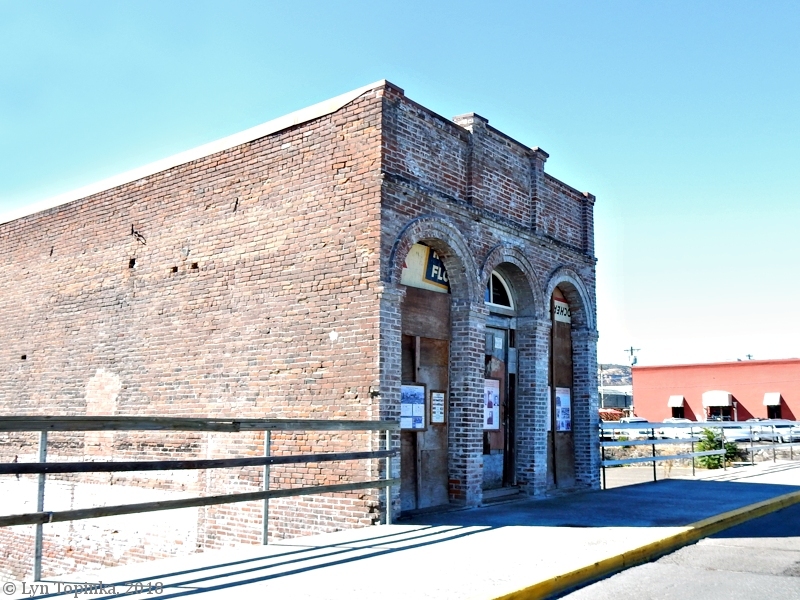 The City of The Dalles currently owns the building." Click image to enlarge Historic Waldron Drug Store, The Dalles, Oregon. Front view as seen from car on First Street. Image taken May 8, 2013. Click image to enlarge Historic Waldron Drug Store, The Dalles, Oregon. Back view as seen from car on Highway 84. Image taken June 5, 2013. 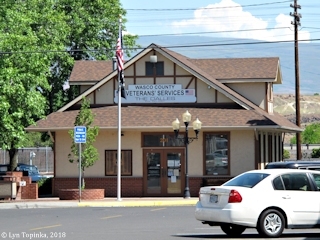 Click image to enlarge Waldron Drug, The Dalles, Oregon. Image taken September 24, 2018. "The Wing Hong Tai Company building (known as the Chinese Building) was built in 1878, replacing a structure that had burned in the 1877 fire. It was built as a fire-proof structure, with a layer of bricks on the roof. Its floor and roof were raised after 1882 to meet the new street grade that was raised by the railroad construction. After the railroad was built, the first street area was no longer the main business district, so the businesses moved to Second and Third streets. It became Chinatown with saloons, brothels, and second hand stores, etc. The building was used as a Chinese laundry and merchandise store from about the 1880’s to the 1920’s. After that it was a dairy distribution building, furniture storage and a work shop. View from the exterior only." The building is known locally as the Chinese building from its association with the Chinese in The Dalles and their businesses on First Street. The influx of the Chinese population occurred c.1880 during the construction of the railroad. A long time owner of the building was Bernard Wolf who owned the structure from 1877 to 1904 when it was sold to Esther Harris in 1904. An early tenant of the building was Mr. Chew Kee who operated a Chinese business. Another Chinese business, directly to the east, was operated by Mr. Doc Sing Wing Kee. This building was used as a Chinese store and laundry house; the building was still being used by Chinese tenant on the 1926 Sanborn Fire Insurance Map. Most other examples of Chinese business, along First Street, were destroyed by flood, fire, or regrading for First Street and the railroad." Click image to enlarge Wing Hong Tai Company, The Dalles, Oregon. Image taken September 24, 2018. Click image to enlarge Penny Postcard: Looking up the Columbia River from The Dalles, Oregon, ca.1910. Penny Postcard, ca.1910, "Looking up the Columbia River, from the Dalles, Oregon.". Published by The Portland Post Card Company, Portland, Oregon. Made in Germany. Card #6033. In the private collection of Lyn Topinka. Click image to enlarge Penny Postcard: Old Fort Dalles, The Dalles, Oregon, ca.1920 Penny Postcard, ca.1920, "Old Fort Dalles, Oregon". Part of the "Ezra Meeker Historical Post Cards for School, Libraries, the Home, and Collections." Each series contains 16 post card views with Historical Sketches on reverse side. In the private collection of Lyn Topinka. Caption on back reads: "In this encampment (called a fort) in the early fifties Grant, Sherman and Sheridan all had their earlier experiences in military life and Indian warfare. Here also lay sick almost to death that delightful writer, Theodore Winthrop, whose untimely death came so early in the War of the Rebellion. 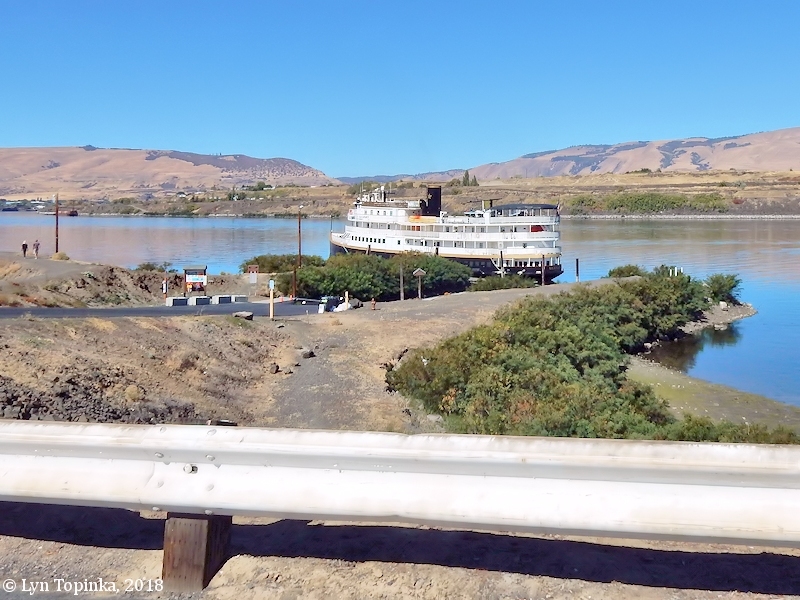 The Dalles proper of the Columbia River is a few miles up river way, where the river is turned on edge through the narrow gap of less than one hundred feet in width, with a channel said to be half a mile in depth. The stretch of river shown in the background is more than a mile in width of placid water, which continues through the great gap of the Cascade Mountains to the Cascade Falls below." The building on the far right was the "Guard House". More image of it can be seen at the Columbia Gorge Discovery Center, The Dalles, Oregon. Click image to enlarge Penny Postcard: Officer's House, Old Fort Dalles, The Dalles, Oregon, ca.1920 Penny Postcard, Postmarked 1910, "Old U.S. Army Post near The Dalles, Oregon.". Building is former "Officer's House", now an Oregon Museum. The "Officer's House" is the oldest history museaum in Oregon. The house was built in 1856. Published by Portland Post Card Co., Portland, Oregon, and Seattle, Washington. Made in Germany. Card #70543. In the private collection of Lyn Topinka. Click image to enlarge Penny Postcard: Seufert Brothers Cannery, The Dalles, Oregon, ca.1909 Penny Postcard, Dated 1909, "Seufert Brothers Col, Salmon Cannery, The Dalles, Oregon, The Dalles in the Distance.". Mount Hood, Oregon, is on the left. Published by The Portland Post Card Company, Portland, Oregon. Card #6027. Hand-written message on card is dated January 3, 1909. In the private collection of Lyn Topinka. Click image to enlarge Penny Postcard: Seining for Salmon near The Dalles, Oregon, ca.1910. Penny Postcard, ca.1910, "Seining Salmon, near The Dalles, Oregon.". Published by Benj. A. Gifford, The Dalles, Oregon. Made in Germany. Card #265. In the private collection of Lyn Topinka. Click image to enlarge Penny Postcard: Seining for Salmon near The Dalles, Oregon, ca.1910. Penny Postcard, ca.1910, "Seining Crew Hauling Seine Columbia River.". Published by Pacific Novelty Co., San Francisco. Made in Great Britain. Card #928. In the private collection of Lyn Topinka. Click image to enlarge Penny Postcard: Mount Hood from The Dalles, ca.1920 Penny Postcard, ca.1920, "Mount Hood as seen from bank of the Columbia River near The Dalles, Ore.". A.M. Prentiss Photo. Published by Lipschuetz and Katz, Portland, Oregon. Card #447. In the private collection of Lyn Topinka.